The slugfest began with my first Twelve Step meeting–I was twenty-eight. I was forty-two when I put the bottle down and waved the white flag of surrender. After little blips, like trying to burn down my place of employment, I grudgingly acknowledged there might be a problem. Then I spent more than a decade in the ring fighting a disease that knocked me down repeatedly. A professional boxing match lasts twelve rounds; I dragged this fight out for fourteen years. Fourteen years in which I had drunk the fun out of drinking but kept at it anyway. In and out of the rooms of recovery. In and out of hospitals. In and out of relationships. Unlike Roberto Duran facing Sugar Ray Leonard, I didn’t have the presence of mind to throw up my hands and gasp “no mas.” At the end I was beaten down, but I had been beaten down so often it felt rather comfortable and familiar. My ability to distinguish the real from the unreal was compromised. You could have fed me rabbit droppings and told me they were delicious black beans—my ability to perceive reality was clouded by an eighty-proof fog. Like “The Force” in young Skywalker, denial ran strong in my veins. Acceptance and I didn’t even have a fleeting acquaintance. I needed thousands of clinking, completely drained, bone-dry bottles to beat me into submission. In a desperate state—out of options, tired of my little schemes—I finally yield to the fact that a successful start to recovery is marked by acceptance. We accept that we are powerless over our addiction—that we need a better source of power than self-will. We accept that our lives have become unmanageable—that we need to turn over management to some entity greater than ourselves. We accept complete defeat—that we acknowledge, not that we are failures, but that our self-centered approach to life is, indeed, a failed approach. Acceptance is the starting point. Until I accepted I was alcoholic I could seek no recovery. Until I accepted that my internal wiring predisposes me to bouts of mania and depression I could not seek medical assistance or make needed lifestyle changes. Until I accepted the many mistakes I have made, I could make no amends. 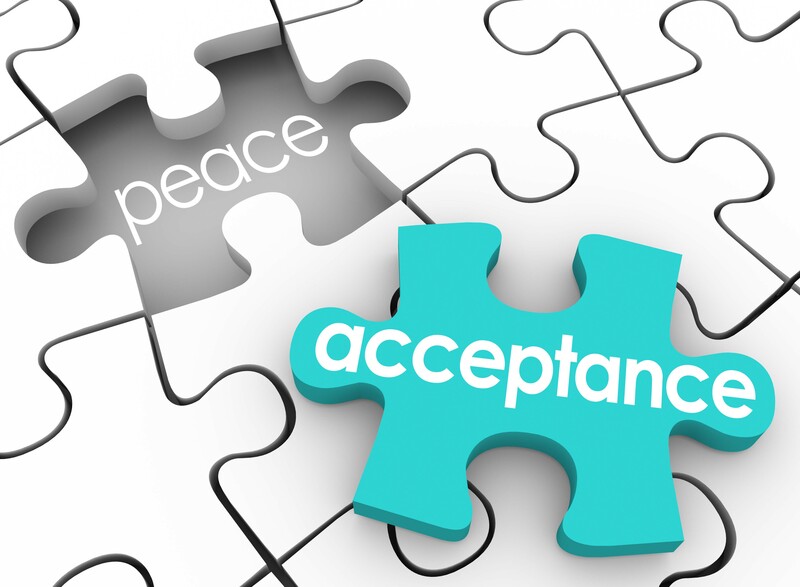 Unless there is complete acceptance, we will never develop the willingness to throw ourselves completely into the remaining eleven steps of recovery. We need to be “all in” if a recovered, purposeful, joyous life is our goal. Writing in the Twelve Steps and Twelve Traditions, Bill W. notes: “We know little good can come to any alcoholic who joins A.A. unless he has first accepted his devastating weakness and all its consequences. Until he so humbles himself, his sobriety—if any—will be precarious.” I believe this is true for all addictions. Yes, acceptance takes humility. The world and its people do not revolve around us. We must accept everything as it really is before we can begin to move forward. Of course there are always parts of ourselves that are acceptable—they just fit. They reinforce our self-image. But then there are those aspect we can only see if we humble ourselves. How can we change if we don’t first accept those aspects? We get nowhere if we act as if we are something we are not—if we resist. Of course we can never attain a level of perfect humility and acceptance. So do we just discard these principles? This “all or nothing” thinking must be discarded if we are to make any spiritual progress. Like any worthwhile endeavor there will be successes and there will be failures. The key is to keep pushing forward. Like cycling up a hill, we are either in slow forward or fast reverse. I remember when my first sponsor asked me to list all my resentments. What? Me resentful? The image I had of myself was not that of an angry drunk. How dare he suggest such a thing? Didn’t he realize I was drinking my way to sainthood? I resented no one. For days, I stalled on this task. But at some level I knew not to quit. I explained to my sponsor that resentments were not forthcoming. I asked for help. Not dissuaded, my sponsor asked me to get on my knees—a humbling proposition—and pray that more be revealed. Blessed with the gift of desperation–a true desire to recover–I was willing to do that. On my knees—praying to a God I doubted–I found that buried beneath nearly impenetrable layers of shame, deception, denial and fear were deep resentments—page upon page on my written Fourth Step. As I accepted this truth about myself, that I was indeed an angry drunk, a pattern emerged. I would resent someone or some institution and then I would lash out. My instinctual reaction was to meet hurt with hurt. I was going to screw you over by stealing from you, not filing my taxes, gossiping about you, cheating on you or myriad other forms of attack. Then my feelings turned from resentment to guilt—guilt that I attempted to wash away with gallons and gallons of vodka or whatever pills I could lay hold of. Humbled for a season, I was able to get honest about the kind of drunk I was. With that came an empowering sense of acceptance. Acceptance that served as a catalyst of change. Nothing clarifies thought, brings peace of mind or puts us in a position to effect positive change like acceptance–acceptance of everything as it is right now; no vain attempts to rewrite the past or worrying about a future that may never materialize. I accept life on life’s term. I accept you as you are–understanding that I don’t know all the problems and challenges you have faced that make you the way you are. I accept myself as I am—warts and all. I accept that I am human and that there are powers greater than me. I may choose to call those powers God, but I must also accept my limited understanding of the divine and the attendant doubts that may arise.